The current round of collective bargaining between the College Employer Council and your college faculty bargaining team is no ordinary round. In the colleges’ current governance structure, college administrators see faculty as employees only, not as colleagues whose voice in setting the academic direction of colleges is fundamentally important to student success. 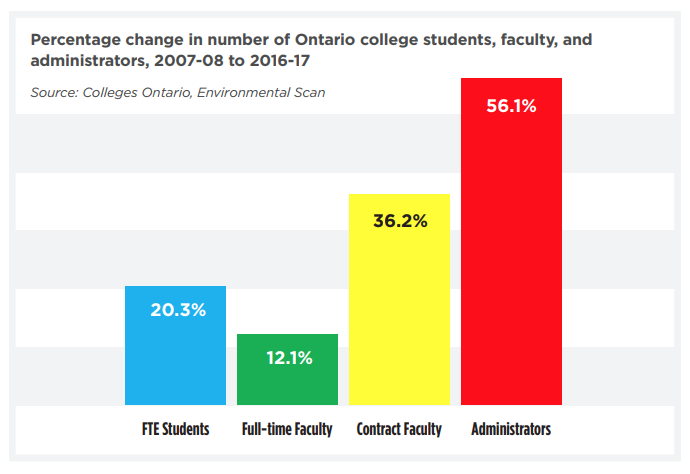 When it comes to faculty jobs, the colleges’ approach is a cheap labour strategy that is designed to swell the ranks of underpaid contract faculty with no job security while relentlessly suppressing the growth in full-time, permanent positions. That the colleges support this status quo is hypocritical. Students come to college for many reasons, but chief among them is to get the education they need for the job they want. Yet increasingly, the jobs the colleges themselves are offering are exactly the jobs our students are studying to avoid – insecure jobs with substandard wages, no benefits, and no future. We need a better plan, for students and faculty alike. In a modern post-secondary system, education quality is supported by the strong voice of faculty on academic decisions. Academic freedom and intellectual property establish the minimum standard for faculty at colleges that offer collaborative degrees with university partners, offer their own stand-alone degrees, and pursue applied research. Along with collegial governance, academic freedom is an essential requirement for post-secondary institutions engaged in these activities. In a modern post-secondary system, fairness for faculty is an enforceable right, not just a dream. As our leaders in government realize that the world of precarious contract work is simply not working for huge sections of the population, college faculty are leading the way on the path to better workplace standards for all workers, including our students. Bargaining a better future is not an abstract exercise. Our approach at the bargaining table has been reasonable, practical, and based on existing best practices in other post-secondary systems. Our goal is to bargain a fair and reasonable contract before our contract officially expires this Saturday, September 30. To that end, your faculty bargaining team made a number of moves at the bargaining table yesterday that were designed to break the current logjam. We streamlined our proposals and put forward workable solutions, including around cost concerns, on collegial governance, faculty complement, academic freedom and intellectual property, and other issues. Our proposals sparked the first significant discussions at the table to date, even though management continues to dismiss faculty concerns with a simple no. You can review our full proposal at http://www.collegefaculty.org/comprehensive_offer_of_settlement_september_27_2017. Your faculty team continues to push for negotiations to begin in earnest now. We will keep you updated as events unfold.